My webpage may contain links to external websites. I hereby disclaim all responsibility for any of the content on these sites and I make no representation or warranty as to the accuracy, value, integrity, completeness or authenticity of the information or opinions contained in any such linked website. The contents and design of this site are subject to German copyright law. 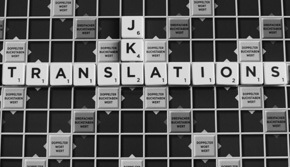 The duplication, treatment, distribution and any type of use outside the boundaries of copyright require the written agreement of jkl-translations.